If memory serves, King Leoric was a stand-up guy before he fell under the corrupting influence of the Lord of Terror. But then there was that spot of unpleasantness in Tristram, and now he's known to the world as the Skeleton King—and he's taking his act to Heroes of the Storm. Blizzard's new Heroes of the Storm spotlight video portrays Leoric as "a front-line bruiser with a unique kit" that blends "an odd mixture of damage, control, and mobility." His play style is very similar to fellow Diabloite Tyrael and Anub'arak of World of Warcraft, and he brings a "good bit of tankiness" to the table as well as decent mobility and a degree of supplemental damage and utility. When he dies on the field, he becomes a controllable wraith, and can continue to employ two of his abilities: the devastating frontal cleave Skeletal Swing (called Ghastly Swing in wraith form), and Drain Hope, which drains enemy hit points over a four-second span. 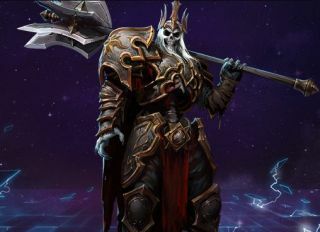 King Leoric will join Heroes of the Storm during the Eternal Conflict event, which is adding a pile of Diablo-related content (including The Butcher, who we ran into last month). Learn more about the Skeleton King at the Heroes Nexus.